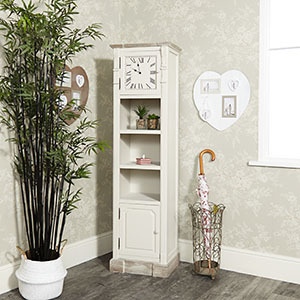 The Lyon Range is a beautiful selection of wooden furniture with a distressed cream painted finish. Each piece from this range has a limed wooden top, column inspired carved detailing and vintage style cream metal cupped handles. The Lyon range is one of our most popular and extensive furniture collections with items designed in this range for bedroom, bathroom, kitchen, living room, hallway and office use. The Lyon Range’s vintage yet rustic design lends it the ability to blend into a variety of interior décor themes such as shabby chic, vintage, industrial, retro, traditional, rustic, contemporary and country style homes. The Lyon range is the perfect furniture collection for those who would like matching items in each room of their home that have a timeless appeal and excellent craftsmanship. View the full Lyon Range and find the right item for your home.